No Noise. No Pets. No Barbecues. No Drawing Pins…Working as a receptionist in an apartment block, Vaselina lives a very quiet life – the residents and their rules see to that. Then, someone strange and scary, moves onto floor 101. She likes her music loud, her cats to roam free, she scorns the rulebook and – she’s always hungry, very hungry… Timid Vaselina is the one who must confront her. This production is a new take on the traditional Slavic folktale of Baba Yaga, the witch who lives at the edge of the forest in a hut that stands on chicken legs, and who feasts on her luckless visitors. In this version, it’s no surprise that Vaselina dreads confronting the modern wild woman who wears a handbag for a hat, and plays two recorders at once, sometimes through her nose. But then, Vaselina’s fear turns to fascination and a whole new world opens up for her. After all, as Baba Yaga says, “Impossible spells I’m possible”. It’s a strong performance mixed with excellent animated projections from Chris Edser & Ailsa Paterson, rousing music, clever sound effects (Peter Nelson), and zany costumes (Selene Cochrane). Baba Yaga’s traditional affinity with nature sees her buzzing off as a bumble bee when she’s bored – a nice touch – and if the diversions into space and the mountains are, perhaps, a little bit too diverting from the story, well, it’s still very well done. When I asked the 7 year old with me what he thought it was about, he said, without hesitation, ‘about the girl finding her own true self’, which is a decent summing up. If you, or rather your ‘7-12 year old’ likes quirky, colourful, fun, and a little bit spooky, this is one to watch. Commissioned by Imaginate and Windmill Theatre Co, this surreal and imaginative musical journey, with an international feel, is co-created by director Rosemary Myers and artists, Shona Reppe (Scotland) and Christine Johnston (Australia). 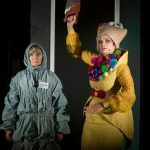 Imaginate celebrates children’s theatre and dance from around the world and produces the Edinburgh International Children’s Festival, running from 26th May – 3rd June.